National Assessment and Accreditation Council (NAAC), Bangaluru has accredited M. M. Modi College, Patiala with ‘A’ Grade (3.26 / 4.00 CGPA) in its 6th Round Meeting held on 1st May, 2015. A special function was organized in the College to celebrate this distinctive achievement of the College. College Principal, Dr. Khushvinder Kumar congratulated the entire staff for this achievement and also complimented for untiring efforts made by them to reach this appreciable level of performance. 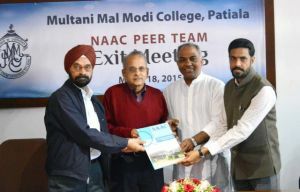 The NAAC Report prepared by the peer team was shown to the staff which enabled them to understand the strengths and opportunities which the peer team has listed in the report. The Principal told that out of 35000 colleges and 600 plus Universities in the country, only 3657 colleges and 123 Universities have been accredited by the NAAC so far. The JNU has highest score of 3.91 CGPA. Only 41 colleges in Punjab have been accredited with ‘A’ Grade. Senior faculty members of the college Dr. Vinay Jain, Prof. Nirmal Singh, Prof. Sharwan Kumar, Prof. Balvir Singh and Dr. Harcharan Singh also expressed their views on the occasion.